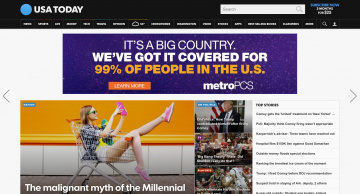 USA TODAY informs and entertains in a quick, concise format providing cutting-edge news, trends and analysis in four complete color sections - News, Money, Sports, and Life. Cash back is only available for Print Newspaper subscription, Sports Weekly subscription, or e-Edition subscription. New home delivery subscription offers are valid in the continental U.S. and Hawaii only. Click a Coupon or click Start Shopping to earn $8 Cash Back at USA TODAY.